A top airport official said the pilot of US-Bangla Airlines flight BS211 did not follow landing instructions from the control tower and approached the airport’s one runway from the wrong direction. “The airplane was not properly aligned with the runway. The tower repeatedly asked if the pilot was OK and the reply was ‘yes,’” said Raj Kumar Chetri, the airport’s general manager. But a recording of the conversations between the pilot and air traffic controllers indicated confusion over which direction the plane should land. In the recording, posted by the air traffic monitoring website liveatc.net, conversation veers repeatedly about whether the pilot should land on the airport’s single runway from the south or the north. Seconds later, the controller orders firetrucks onto the runway. 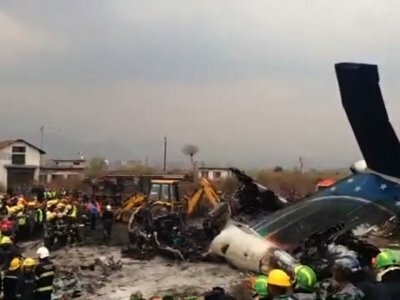 An AP journalist who arrived at the scene soon after the crash saw the twin-propeller plane broken into several large pieces, with dozens of firefighters and rescue workers clustered around the wreckage in a grassy field near the runway. Hundreds of people stood on a nearby hill, staring down at what remained of the Bombardier Dash 8 aircraft. The plane had circled Tribhuvan International Airport twice as it waited for clearance to land, Mohammed Selim, the airline’s manager in Kathmandu, told Dhaka-based Somoy TV by telephone. The plane was 17 years old, company officials said. Nitin Keyal was about to board a domestic flight when he saw the plane coming in. He said it landed just off the runway, broke apart and burst into flames. “For a few minutes no one could believe what was happening. It was just terrible,” he said. Most of the injured were brought to Kathmandu Medical College, where relatives wept as they awaited news. Haran Saran was at the hospital hoping for news about his nephew, a medical student. US-Bangla spokesman Kamrul Islam said the plane was carrying 32 passengers from Bangladesh, 33 from Nepal and one each from China and the Maldives. He did not provide the nationalities of the four crewmembers. US-Bangla operates Boeing 737-800 and smaller Bombardier Dash 8 Q-400 planes. The full-service airline is based in the Bangladeshi capital, Dhaka, and flies to several domestic and international destinations. The parent company, part of US-Bangla Group, is involved in sectors that include real estate, education and agriculture. AP journalists Niranjan Shrestha and Upendra Mansingh in Kathmandu and Julhas Alam in Dhaka, Bangladesh, contributed to this report.